President Park's speech resonated strongly not only with topics covered in this blog, but with me personally, for several reasons. First, as the son of a Lutheran minister, I was struck by the fact that she chose Dresden, a city that was part of East Germany during the Cold War as the location for her speech. 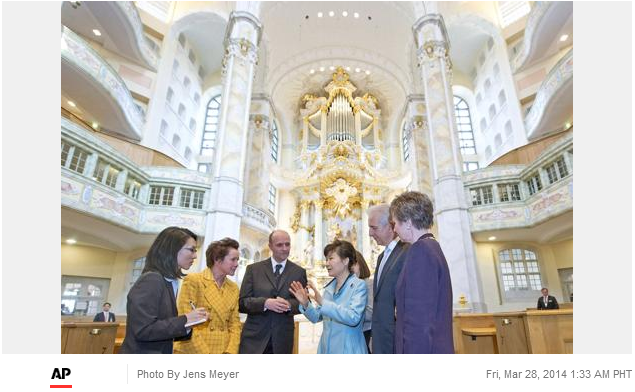 As reported by The Korea Joongang Daily, her first visit while in Dresden was to the Frauenkirche, a Lutheran church destroyed during the bombing of Dresden during World War II. (Click on the accompanying AP photo of her visit to the church to see a full-size version.) As noted in the article, "Her visit to the historic site, which embodies eastern Germany’s rise from ruins to an economic powerhouse, is in tune with her intention to obtain a blueprint for the unification of the Korean Peninsula while in Europe. “President Park chose Dresden as the locale for her symbolic address to show both Koreas that unification may actually turn out to be an opportunity for prosperity,” a Blue House official said." Second, as reported in another article by the same newspaper, President Park gave her address right after receiving an honorary doctorate from the Dresden University of Technology, one of the most prestigious schools in Germany. I believe that KAIST, where I currently work, has a number of ties and common interests with this university in Dresden. Finally, President Park's speech contained three specific proposals to North Korea,. 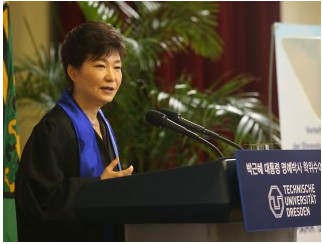 The full text of President Park's address was printed by The Korea Herald. While the selection of excerpts cannot do justice to such a powerful speech, several points made by President Park were of particular relevance to topics treated in this blog, including the following. "As one who studied electronic engineering in college, I hold dear the belief that science and technology are the key to unlocking a nation's advancement. This is why I established the Ministry of Science, ICT and Future Planning early in my presidency and have been highlighting the importance of building a creative economy." President Park invoked the memory of her father and his visit to Germany, saying that "The Korean president who visited Germany at the time felt that Germany's rise from the ashes of the Second World War and its Miracle on the Rhine were feats that could be replicated in Korea. As he was driven on the autobahn and shown the steel mills of German industry, he became convinced that Korea too would need its own autobahn and its own steel industry to effect an economic take-off." The second of President Park's three main proposals dealt with infrastructure. She said, "Second, we must pursue together an agenda for co-prosperity through the building of infrastructure that support the livelihood of people. . . . To help make life less uncomfortable for ordinary North Koreans, Korea could invest in infrastructure-building projects where possible, such as in transportation and telecommunication." I highly recommend reading the full text of this important address and initiative.